In August, G-LO and I embarked on our respective family vacations. I came back empty handed while G-LO stopped once again at the Maine Beer Company. Over his many trips to Maine; he has developed quite an affection for the Maine Beer Company and has brought back a large portion of their line-up to sample. This trip was no exception as he once again came back with a box-o-beer. Because he was raised right, he shared his box with the various porch hangers on. I was lucky enough to get two beers. One such beer was a Pale Ale called A Tiny Beautiful Something, which we reviewed last week. The other was Dinner, a Double IPA. Dinner was first brewed in March of 2014 and was a part of the eight beer rotating line-up when G-LO was there to do some shopping. 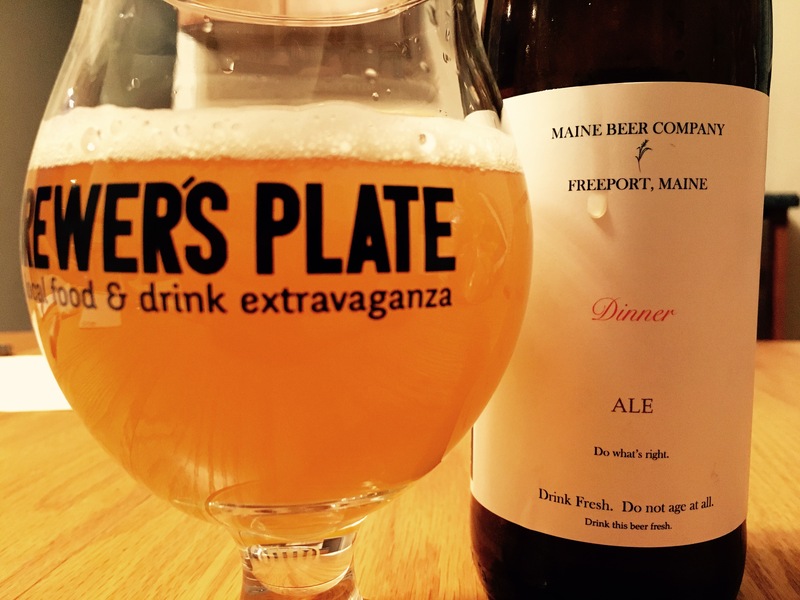 Maine Beer Company products are meant to be enjoyed fresh and I was fortunate enough to get a bottle that was dated 08/20/16 (he just happened to be driving home on the day that it released, so he picked up 6 bottles for sharing and may or may not have used a bottle or two as currency. Sicilians are like that, or so I’m told.). Short of getting a growler from the local Iron Hill Brewery, I don’t know that I’ve ever had a beer this fresh! Once we made Lunch, it was time to whip up some Dinner, hence our first Double IPA. It’s dry, refreshing and a hoppy happening. Our intention for this brew was to really amp up the hop flavor and aroma. So we dry hopped Dinner TWICE, with over 6 pounds of hops per barrel. This deep dive into hops means freshness is critical, so when you get yours, only get what you’re planning to drink. No more, no less, no tucking in the back of the fridge. Appearance: Cloudy, pale orange color with a fluffy head and moderate lacing. Limpd: All kinds of hoppy funk. Grapefruit, oranges, pine needles & BO. G-LO: A smattering of funk and a robust hit of grapefruit zest. Some herbal notes on the back-end. Limpd: Medium carbonation and mouthfeel. A little malty and sweet followed by a blast of hoppy goodness ending in a somewhat tart, somewhat bitter, dry finish. G-LO: Lightly carbonated. Intense citrusy hop flavors from start to finish. Yet somehow, it’s never overwhelming. Quite crisp at the finish. Also, quite dry. Limpd: Dinner was a fantastic representation of a Double IPA. I would put this right up there with Lawson’s Sip of Sunshine. It was exactly what I have come to expect from the Maine Beer Company; a well-crafted, exceptionally well-balanced and flavorful beer. Well done! G-LO: As I have mentioned quite often, I have a soft spot for this brewery. Peeper was the first of their beers that I had back in 2011. Over the years, I’ve been lucky enough to try most of their line-up and they rarely disappoint. Dinner is yet another solid beer from them. I would love to try this alongside a Heady Topper or other top rated Double IPA. There aren’t too many phrases in the English language as satisfying as “box-o-beer”!! How about Box-O-Bud Light Lime? That would not be better. That would be decidedly worse. Well, let’s look at this mathematically. In order for that to be true, one would need to consider the following equation: Bud Light Lime == beer. Since that equation is false, your statement cannot be true! Me thinks a new post is in order. We can call it Beer Math 101.